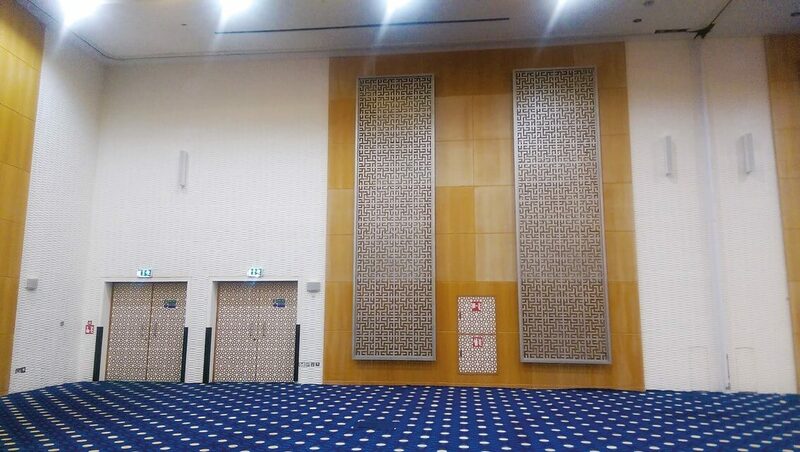 The upgrade to the audio systems in a pair of conference halls at ADNEC has given Aimline Audio its highest-profile reference to date in the Middle East. Systech middle east is no stranger to the Abu Dhabi National Exhibition Centre (ADNEC). The Abu Dhabibased systems integrator regularly participates in tenders put out by the exhibition centre and counts it as a regular client. 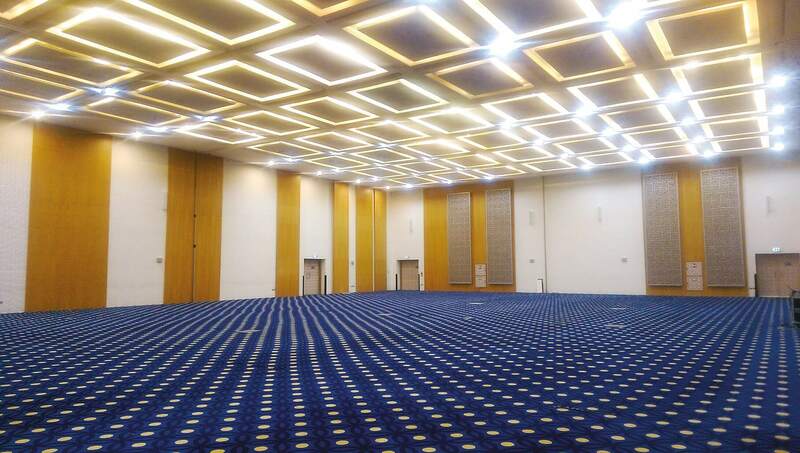 The latest project it has been involved in at the venue called for a new audio solution for conference halls A and B. To win this deal and tackle the acoustic challenges presented by both halls, Systech decided to take a fresh approach with the equipment it specified. The primary purpose of the audio systems in both halls is vocal reproduction. As such, Systech was looking for a solution that performed well in the vocal range and could also keep energy off the rooms’ reflective surfaces. Having analysed the needs of the spaces and looked at the existing system, Systech decided that a steerable solution would be the best option. Our client needed to have a high-quality audio solution that would be able to cover their activities in these multi-functional rooms, recalls Malek Ghorayeb, general manager, Systech Middle East. To achieve this we opted for the ALX 8.0 from Aimline Audio. They were a competitive price and offered the right functionality. 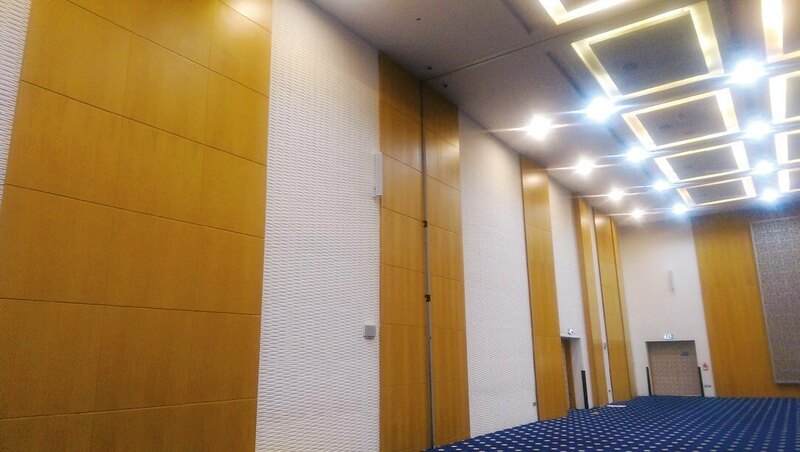 Their sound quality was highly suitable for the application and the beam steering helped us to deal with the high reverberation. 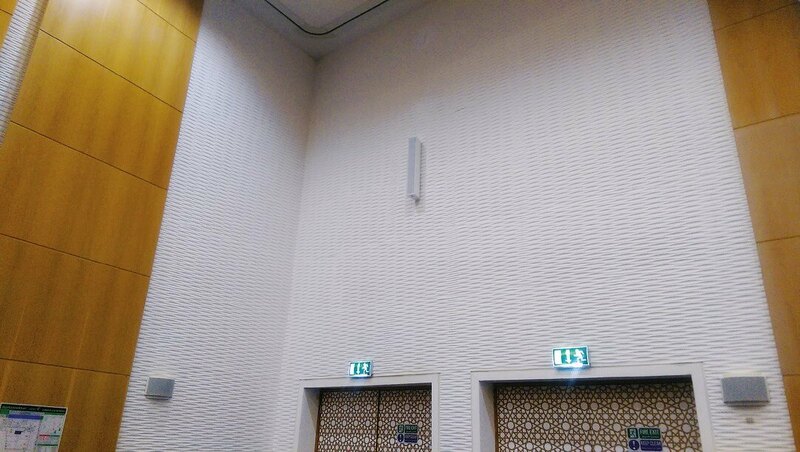 The high reverberation time and the amount of reflection in both halls made these the right speakers for the job. There are many factors that contribute to the efficiency and effectiveness of a loudspeaker in a given application, including box design, the driver brand and, of course, the amplifier/DSP that drives them, adds Nigel Miller, international sales and marketing manager for Aimline Audio. Choosing drivers that are more suitable than other general-purpose loudspeakers for speech intelligibility is very important. Many buildings incorporate hard reflective surfaces that cause the audio signal to reverberate and distort. Traditional general-purpose loudspeakers offer little to combat this. Beam steering loudspeakers allow comprehensive control of the audio beam, including vertical and horizontal positioning, plus width and distance with DSP functionality, he continues. This allows the audio energy to be directed away as much as possible from reflective surfaces resulting in vastly improved speech intelligibility. 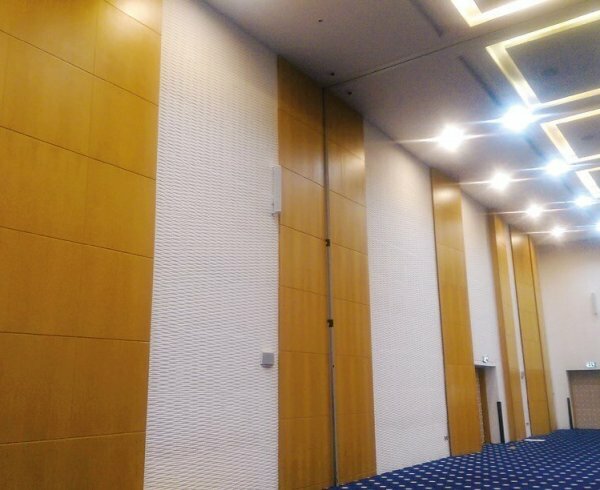 While the Aimline speakers were designed primarily for this kind of application, the rooms they were being installed into still presented a number of challenges. We found a limitation in the calibration of the system due to the architectural materials used in the halls, explains Mr Ghorayeb. There was very poor speech intelligibility and high amounts of reflection from the entrance doors. The conference rooms are very big and it was a challenge to calibrate the audio in the right way to cover different types of events. They can be divided into two so we also had to cater for that within our designs. The design itself saw each room fitted with identical solutions. Six of the active ALX 8.0 speakers have been installed around the room. Two act as the main system when each conference hall is being used as a whole, while the other four form individual systems when the rooms are divided in half. At the other end of the signal chain, a comprehensive Shure wired and wireless system acts as the source. Wired SM58 handheld units are joined by a ULX-D wireless system offering handhelds and bodypacks that combine with Countryman E6 earset mics. Sitting between the input and output is an Ashly Audio DigiMix 24 digital audio mixer, while processing is courtesy of an Ashly ne8800 8×8 DSP. Completing the solution, and ensuring everything can be networked, are a pair of Attero Tech Dante unD41 four input Dante interface units combined with an HP network switch and a Dell laptop running Dante software. 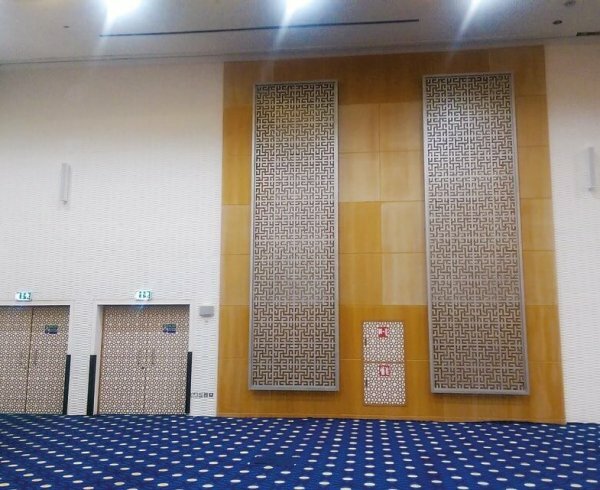 The project ran for around a month and a half and, while he would perhaps consider some acoustic treatment for the doors in the future to minimise late reflections, Mr Ghorayeb is pleased with the results. The client is satisfied, which means we are happy. However, from the Aimline point of view, this project takes on much more significance. 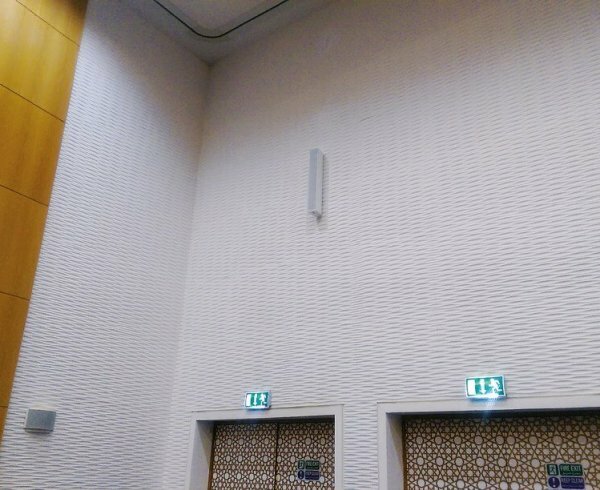 The manufacturer’s smaller columns have been used in some mosque projects in the Middle East, but this is the first time its ALX speakers have been specified in the region. Aimline is a relatively new company and visibility is important in order for people to see the new problem-solving solutions it can offer, including the latest single cable solution allowing both data and audio on a single cable, offers Mr Miller. The project at ADNEC illustrates how effective our solutions can be when incorporating Dante I/O with digital beam steering.